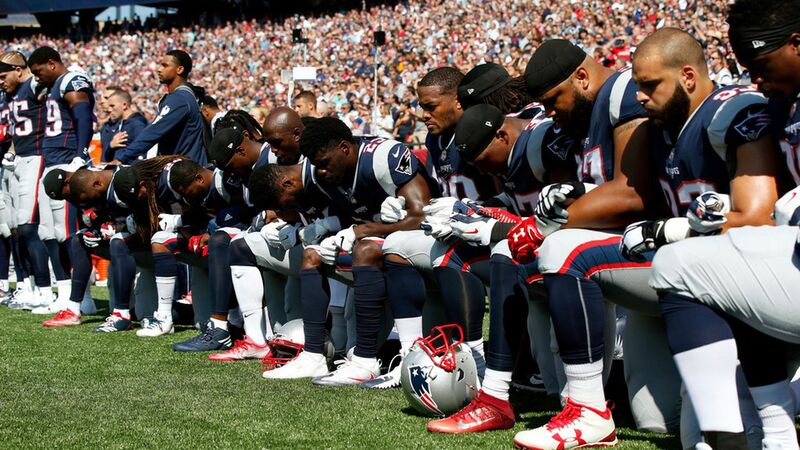 Beginning with the early game in London where several players from both the Ravens and Jaguars knelt during the national anthem, and heading into the first full slate of games when the Steelers declined to take the field for the anthem and teams across the league locked arms in solidarity, the NFL is showing collective resistance today to President Trump's comments about players who protest during the anthem. Before the games, Trump tweeted that those who refuse to stand should be fired or suspended. After the much-expanded protests, Trump followed up: "Great solidarity for our National Anthem and for our Country. Standing with locked arms is good, kneeling is not acceptable. Bad ratings!" He later told reporters the situation had "nothing to do with race." Go deeper: The Great Divider, What Trump/NFL are thinking, the conversation, Trump on NFL/race. One more Trump tweet: "Courageous Patriots have fought and died for our great American Flag --- we MUST honor and respect it! MAKE AMERICA GREAT AGAIN!" The Pittsburgh Steelers didn't take the field for the anthem. Coach Mike Tomlin said he didn't want the players to have to choose whether to protest or not. Tackle Alejandro Villanueva, a former Army ranger, stood alone and sang along. Patriots owner Robert Kraft, a friend and donor of Trump's, said he was "deeply disappointed" by the president's remarks. Shahid Khan, the Jaguars owner who gave $1 million to Trump's inaugural committee, linked arms with his players in a show of solidarity. Rex Ryan, the former Bills coach who once introduced Trump at a rally, said he was "pissed off" by Trump's descriptions of protesting players.